We got out hands on the new premium Beats headphones sans cable. The Beats by Dr Dre headphones haven't be around for long but, as our review clearly points out, it's a big contender in the world of ear cans. Not only will we be seeing a Beats by Dr Dre store in the near future, but the recent tie-up with smartphone makers HTC, seen in our HTC Sensation XL with Beats by Dr Dre review, is testament to their burgeoning power. And if that wasn't enough, Monster Beats by Dr Dre, one of the earlier models, even won T3's 2011 Music Gadget of the Year Award. Whether you're listening to NWA's Straight Outta Compton or Jedward's Planet Jedward, Dr Dre's Beats by Dre headphones have become the premium brand headphones to be seen with in public. From Premier League footballers to the teenagers who hang outside our local branch of Lidl - everyone wears them. And now they're wireless. That's a great thing, right? Well... these new cable free cans connect to any music playing device via Bluetooth, something that can cause a dip in audio quality compared to going wireless via WiFi or say Apple's AirPlay for iTunes. Nevertheless, Bluetooth remains the most practical option and Dre's team are promising the quality Beats are known for has not been compromised. Smaller than the "classic" Beats Studio range that Beats By Dre have built their reputation upon, the Beats Wireless is essentially a tweaked pair of their smaller Solo 'phones. They're slightly weighty due to the batteries, controls, Bluetooth tech, and microphone built inside, but it's a good weight for the size of the product. It feels right in your hand, on your head, and crucially around your neck (where most people seem to wear Beats). The squishy ear pads, and smoothly folding arms add to the general feel that this is definitely a high end product. Even if you hate Dre (yes Ice Cube, we're talking to you here) you cannot deny that these new headphones look pretty damned beautiful. At a time when Beats have launched some neon coloured Studio headphones, these are gloriously black, minimalistic, with more curves than a zero. All the class of the Solo, with ear cup controls that are thankfully barely visible. The controls being as they are may make the headphones fiddly to use for some, but let's face it you're not looking at the buttons whilst they're on your ears anyway. Unless you're some kind of weird lizard or owl. The built in Bluetooth technology wirelessly connects to your smart phone, tablet, laptop, PC, whatever. It does this with absolutely no fuss - our pair connected to our iPhone and started playing music without us even asking it to. Managing the volume, skipping tracks, and answering phone calls is all managed directly from the ear cups, which could take some getting use to. For a while you might be taking the cups off to remember what button does what, but that time will pass quickly enough. Recharging via a USB is simple and fuss free, and the quality of audio meanwhile is simply excellent despite our fears over what the Bluetooth might do to it. If we're being pernickety, we'd say it's perhaps a little bassy, but there's little distortion and the sound is anything but flat. 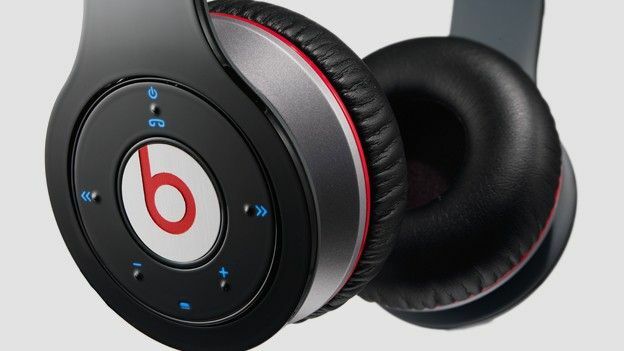 A UK price tag has yet to be confirmed, but they'll no doubt be in line with other Beats prices (AKA not cheap). As with all 'phones however you pay for what you get, and Beats Wireless ooze quality, crucially in the key areas of audio performance and style. Hell, even the way they fold up feels so right. If it's priced sensibly, this could be one of the must have audio products of 2012. Beats Wireless availability: later this year for purchase exclusively at Apple stores.